Communication Objectives: The aim of this lesson is to teach ESL learners how to express abilities in English. Language Objectives: The objective is to teach learners how to use modal verbs 'can' and 'can't to express abilities. The lesson will in so doing, introduce a number of action verbs in the present simple tense. 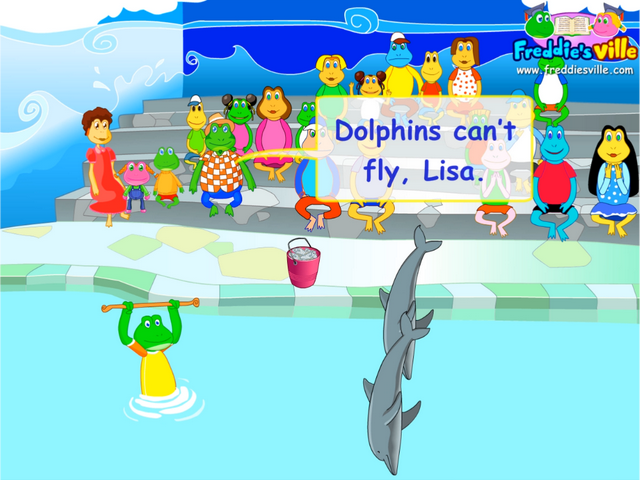 Dialogue Story: Freddie, Lisa and parents are watching a dolphin show. It is an exciting day out for the kids as they watch in amazement at some of the things dolphins can do. Lisa is so excited she tries to feed the dolphins and a happy dolphin makes a big splash. I can't jump that high. They can swim and jump at the same time. Dolphins can do many things. Can they read and write?